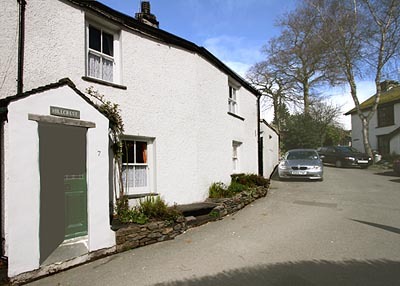 Hillcrest is a fascinating one bedroom cottage located in the sought-after conservation area of old Ambleside. It provides an interesting and comfortable secluded retreat for two people. The cottage dates from the 16th century and the original beams and other features remain, while modern underfloor heating ensures your comfort. The range shown above, believed to be the original, is still in good working order and can be used optionally as an open fire. 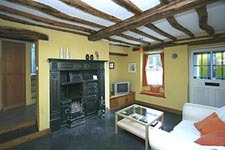 The cottage is decorated in period style and has comfortable furnishings. It is ideally located on a quiet lane with very limited through traffic and within a 3-minute stroll from all Ambleside’s amenities. A number of popular walks, easy or more strenuous, start within yards of the front door. There is unrestricted on-street parking for one car. 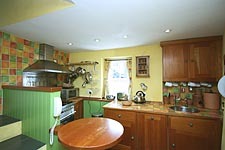 Accommodation downstairs consists of a pleasant beamed sitting room and the kitchen/dining room. The sitting room has settee and tv, with the range shown above. The kitchen has an electric oven with gas hobs, microwave and fridge. A spacious outhouse immediately outside the back entrance has a washer/dryer and freezer, also ample space for safe bike storage. The bedroom has one double bed and ample storage space. A superb bathroom has oval bath, separate shower, washbasin and WC. Outside, off a shared access passage, is a small sun-trap patio area with table and chairs. or email bookings@hillcrestcottage.co.uk or phone 015398 98012. Terms are from £310 to £540 per week. Changeover day is Saturday. Gas, electricity, bed linen and towels are included also coal for the open fire. Pets accepted and free unlimited wi-fi.